B)The e-mail should also have Full Name and Complete Postal Address of the participant in CAPITAL LETTERS. 6. THE PRIZES: There will be07prizes (First, Second, Third, Special mention-2 and Honourable mention-2). 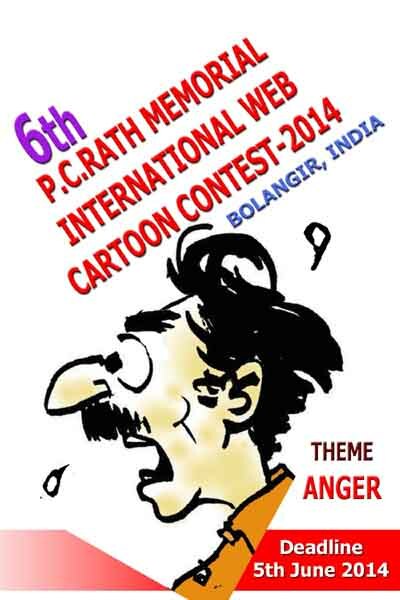 All the prize winners will be awarded with a Diploma Certificate and a CD album of selected cartoons. 8. RIGHTS OF THE ORGANIZER:A) Once sent, the works belong to the organizing committee. It can be published, distributed or used for promotional purpose in future. B)Cartoons should be downloadable and clear. Committee would not be responsible in situations like net-failure,undownloadablecartoon etc. It is therefore advised to keep the file small. C) Plagiarism, if detected, the entry will be summarily rejected or even the diploma would be withdrawn, if awarded.